Flavio Azevedo, Peggy Martalock and Tugba Keser have initiated an important conversation in science education as they use sociocultural theory to introduce design based scenarios into the science classroom. 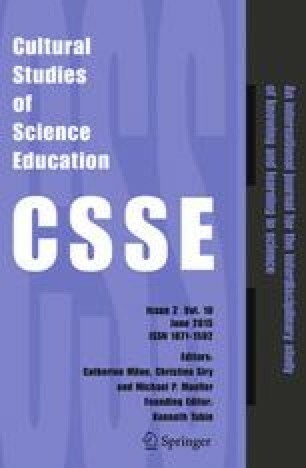 This response seeks to expand Azevedo, Martalock and Keser’s article The discourse of design-based science classroom activities by using a specific perspective within a sociocultural framework. Through using a cultural historical (Vygotsky in The history and development of higher mental functions, Plenum Press, New York, 1987) reading of design based activity and discourse in the science classroom, it is proposed that learning should be an integral part of these processes. Therefore, everyday and scientific concepts are explained and expanded in relation to Inventing Graphing and discourse presented in Azevedo, Martalock and Keser’s article. This response reports on the importance of teacher’s being explicit in relation to connecting everyday and scientific concepts alongside design based activity and related science concepts when teaching students. It is argued that explicit teaching of concepts should be instigated prior to analysis of discourse in the science classroom as it is only with experience and understanding these processes that students have the resources to call upon to argue like practicing scientists. I wish to acknowledge with thanks the help and guidance of Professor Marilyn Fleer and the monthly Everyday and Scientific Concept reading group conversations held by the PhD Cultural Historical Community. Apedoe, X.S., & Schunn, C.D. (2013). Strategies for success: Uncovering what makes students successful in design and learning. Instructional Science, 41(4), 773–791. doi: 10.1007/s11251-012-9251-4.